Begin at the beginning and end at the end. No, thanks! I love the Page 99 test promoted by MommyAdventures. Knowing how tough writing a beginning can be–Cancelled has had five or six different first chapters–and that most first pages get intense scrutiny by authors and editors for “hooking” features, I think the Page 99 test is brilliant. By almost a hundred pages in, a book is in its groove. Artifice is gone; the author has more or less settled into the tone and pacing of the novel. I uploaded my page 99 to the Ford Page 99 test website, so you can visit to decide for yourself if you would turn the page or not. Pulling the material was a surprise for me because it just happens to be the page that Johnathan and Alexis become engaged. With my own engagement being the result of a 3 hour conversation of how we could never marry, I purposely wrote a non-fairy tale “engagement” scene. Sure the Jumbotron “Will you marry me?” stories are precious, but I don't think that's how most people arrive at the crucial moment of engagement any more. For one, couples of my generation have a far more practical and rational attitude towards marriage, or lack thereof (living together), because divorce destroyed our childhoods. So, the engagement scene of Cancelled comes from those prejudices of my own, and I think it's something different than most romances and chicklits out there. Not that the book really needs more leopard spots. It's already a romance/chicklit from a guy's point-of-view. Yes, the story follows Johnathan as he is torn between the woman he loves and has known for years and the woman that is pregnant with his child from a one-night stand he had right before Alexis finally gave him the time of day. Where a normal chicklit has a storyline about the main character's relationship with her family, my story also puts Johnathan stuck between the wants of his biological mother who betrayed his trust and his widowed stepmother who loves him unconditionally, but has her own demons to confront. One one hand, my Page 99 is the denouement of the rising romantic tension between Johnathan and Alexis in the first part of the book. On the other, it's really the point where Johnathan is finally in his quandary. He knows there is a good chance Kellie's baby is his, and now he is engaged to Alexis, albeit a few weeks earlier than he planned. To find out what happens, you have to read the book! As part of the Summer Splash, I am signing ebooks. So if you read page 99, decide you WOULD like to read on, please visit my site, eawestwriting.com/newsletter and sign up for my newsletter to get a free, signed digital copy of Cancelled. Each file is personalized, compiled, and serialized just for you. I email each one individually. It is my small gift back to the wonderful readers who have made this job of “author” just so much fun and a season of my life that I am very proud to be working in. 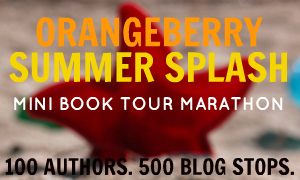 Thank you, everyone at Mommy Adventures for supporting indie authors and inviting those of us in the Orangeberry Summer Splash Book Tour to visit. Elizabeth Ann West is a Jane-of-all-trades, mistress to none! After writing non-fiction professionally for four years, she made the jump to fiction in 2011 with her debut novel, CANCELLED. A chicklit/romance from the male POV, Elizabeth’s novel challenges the conventions of modern romance. Elizabeth has also joined thirty other talented female writers at the Indie Chicks Cafe where she is a regular contributor. She also has a contribution in the latest Indie Chicks Anthology: Ms. Adventures in Travel where she talks about living in 4 different states in a span of 5 years! When she isn't writing, or reading, she's chasing her toddler off whatever piece of furniture she has climbed on now, making pasta from scratch, or rationalizing why she can wait a little bit longer to clean up the house. One day her royalties will go towards the cost of a Roomba.